Architect: Jonathan Stafford. Builder/contractor: Gale M. Roberts Co., Inc. Location: 1580 E. 15th St., University of Oregon, Eugene, OR. Google map location. 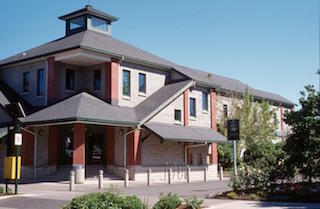 Donated to the University of Oregon by track coach legend, Bill Bowerman, the Bowerman Family Building cost approximately $2 million dollars. Situated at the northeast corner of Hayward Field, the building houses the International Institue for Sport and Human Performance as well as locker rooms, meeting rooms, and treatment failities. Exhibits in the building describe important athletes and athletic events. "Track fans get first look at new Bowerman building," Eugene Register Guard, March 21, 1992. Image source: Edward H. Teague. Oregon Digital.